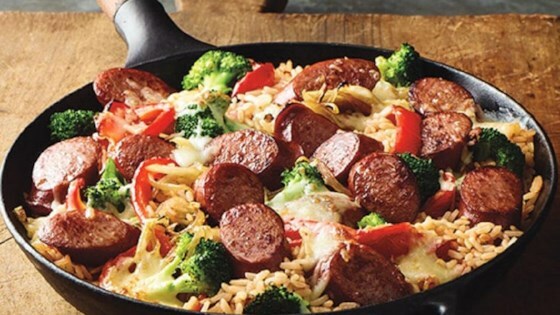 "Dinner's on the table in no time with this one-skillet sausage and veggie dish served over rice." Easy to make, but bland. I managed to salvage it by adding some salt, pepper, and some Creole seasoning I had in my pantry. I took the advice of a bunch of reviewers and added seasoning (garlic powder, basil, Cholula) and some spinach, along with the whole 8oz can of tomato sauce. Absolutely delicious!